Hi, I’m Erin! I’m a wife, mom of two amazing kiddos (one on the way!) and proud owner of Flynntastic Faces. All my life I’ve been drawing and painting, but it wasn’t until I had children of my own that I started painting on canvases that smiled back at me! I take pride in the work that I do and truly enjoy transforming kids (and adults!) 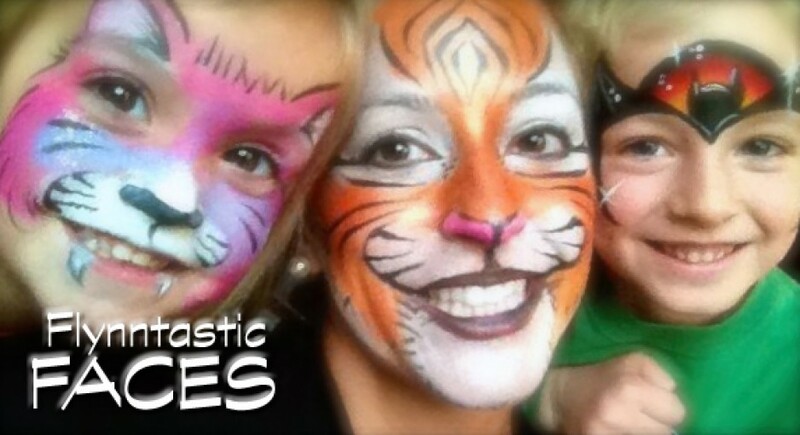 into anything they can imagine – I love face painting and the magic it brings with it! It’s always so much fun to see the smiles and amazement I get from my little customers when they see their reflection in the mirror! I only use high quality, FDA approved products in my work, including, Wolfe, Tag, Paradise and Diamond FX. When I come to an event I arrive early for set up. I bring with me a chair, table, and plenty of design options for the children…The only thing I need is space! I try to keep my prices affordable and base my rate depending on location. Check out my work and contact me today for a quote!